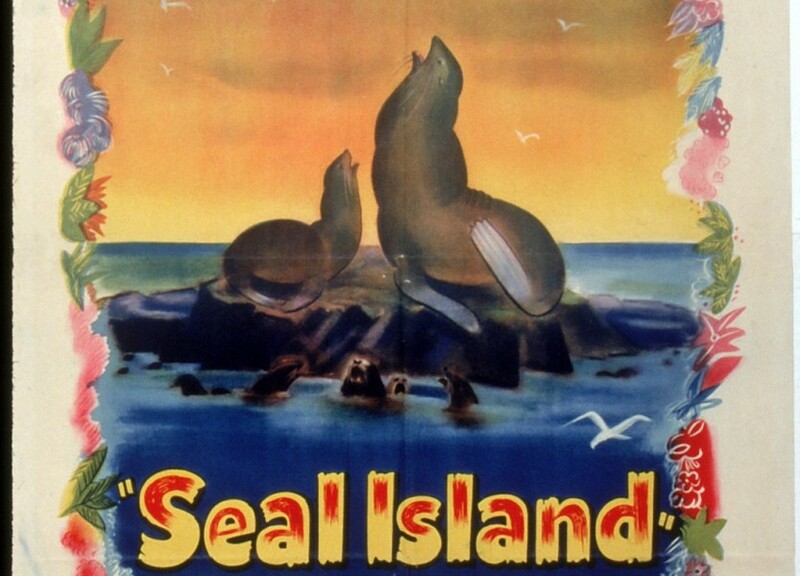 Seal Island (film) The first True-Life Adventure featurette. The fur seals arrive on the fogbound islands known as the Pribilofs to mate and bear pups. The young “bachelors” challenge the older bulls for their harems of females, which results in a terrific fight. In the fall, the herd sets out on a long migration into the Pacific Ocean to spend the winter. Initial release on December 21, 1948; general release on May 4, 1949. Directed by James Algar. 27 min. Alfred and Elma Milotte shot the fascinating footage that formed the beginning of the True-Life Adventure series. Walt Disney had hired them to do some filming for him in Alaska, but as he studied the footage they sent back to the Studio, he zeroed in on the seal footage as having the most promise. He asked them to emphasize the life cycle of the seals, and not show any indication of man’s presence. The resulting film did not appeal to RKO, the Disney distributor, who felt that no one would want to sit in a theater for half an hour watching a nature film, so Walt had a friend of his, who ran the Crown Theater in Pasadena, run the film for a week in order to qualify for an Academy Award. Sure enough, it won the award for Best Documentary. According to legend, Walt took the Oscar down to Roy Disney’s office and said, “Here, Roy, take this over to RKO and bang them over the head with it.” As one could expect, RKO was soon clamoring for more of the True-Life Adventures.